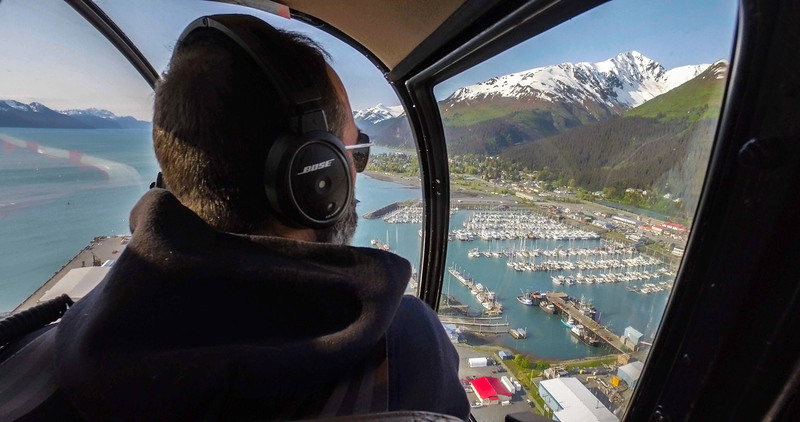 For the helicopter version of this trip, we depart from the Seward Airport and after fastening our seat belts we begin an unforgettable journey, soaring over peaks of the Chugach mountain range and gliding past the Harding Ice field. We might get an overhead view of hungry bears, mountain goats, humpbacks or killer whales. After setting down on the moraine, we’ll grab our custom inflatable stand up boards, slip on a drysuit and step into liquid. 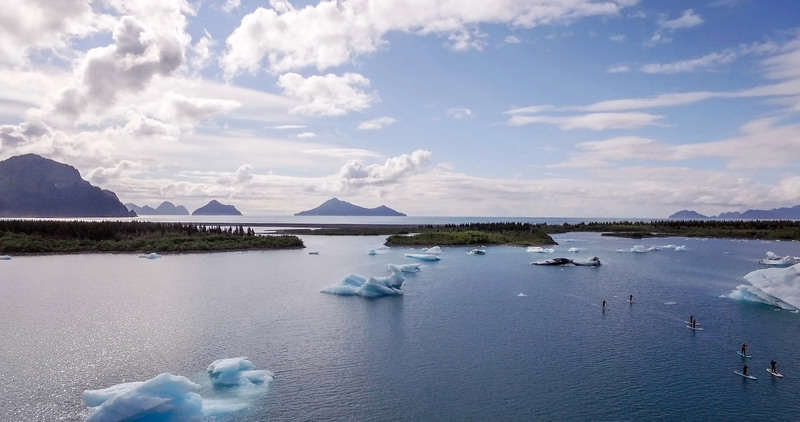 From here, it’s just a short paddle to the lagoon and icebergs. 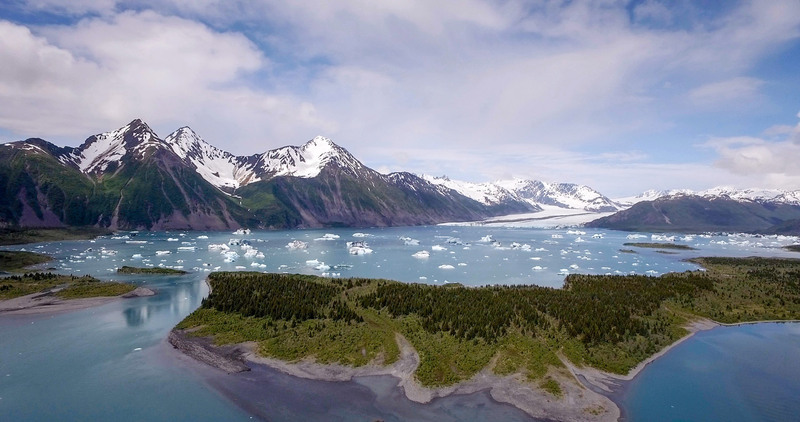 Bear Glacier — the largest glacier in Kenai Fjords National Park – is close to Seward and is also one of the most spectacular places in Alaska. At the base of the glacier's 12 mile ice tongue lies a salt-water lagoon that is filled with massive icebergs and surrounded by mountains of wilderness. The water is calm and protected from waves. This very unique destination offers up some of the coolest paddling on the planet and is an amazing place to visit. Better yet, the access is limited to specialized boats and helicopters! There are no roads and no crowds and you will often be the only visitors on a given day. 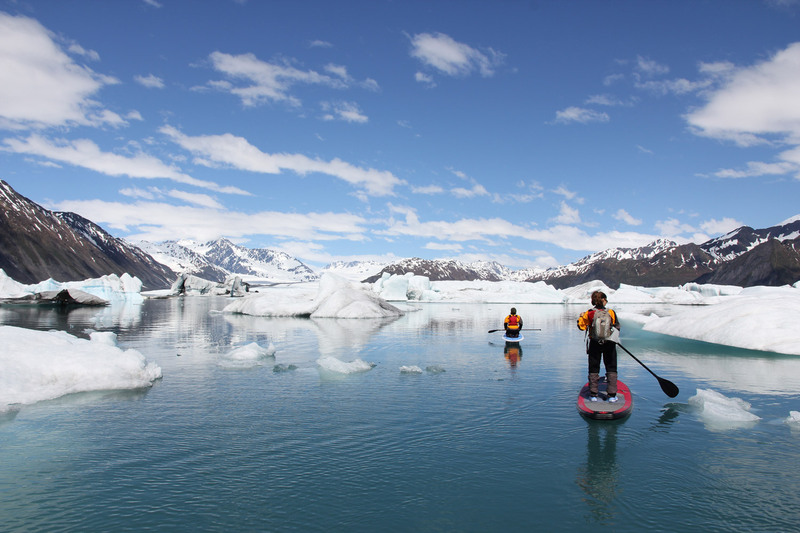 We challenge you to find a more surreal place to paddle board. The features in the lagoon change daily and your guide will choose the best route to navigate through the maze of ice. Wildlife also varies day to day with good chances to view harbor seals and black bears. This tour lasts a little over 4.5 hours. Our schedule for this trip is flexible, and can often be arranged to fit into your itinerary. Advanced reservations are recommended. • This is an adventurous trip. It is very fun, but it's definitely a trip where you are exposed to the elements. • This trip is not designed for first-time paddlers. If you want to go, but don't have experience on a paddlboard, consider our half day intro to the sport. • It's important to bring comfortable and warm clothes to wear under your drysuit to ensure that your experience is as pleasant as possible. We highly recommend that you avoid wearing cotton or denim layers. ​Total trip time is 4.5 hrs from start to finish (approximately). Roughly 3.5 hours are spent paddling. This trip tends to fill up several weeks in advance, as we only take a maximum of 5 clients at a time. Reserve your trip early! From our office, we take a short drive to the local airport. After a short safety briefing, we hop onto the helicopter. 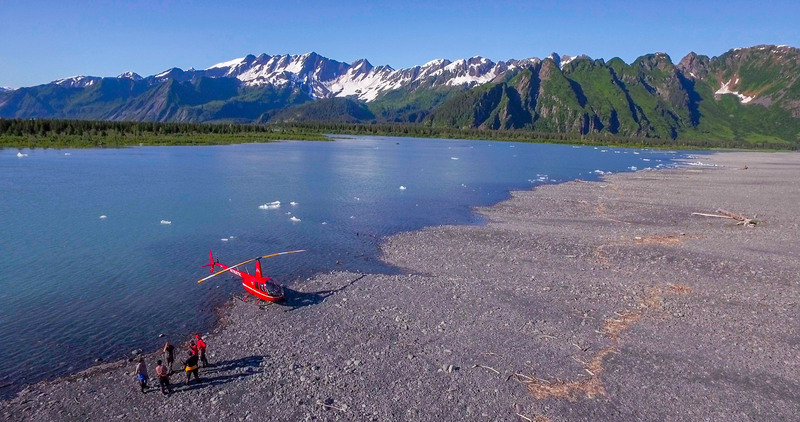 The helicopter is an excellent way to see the coastline and along the way we look for waterfalls, whales, bears, and other spectacular sights. The helicopter we use holds three passengers and a pilot. 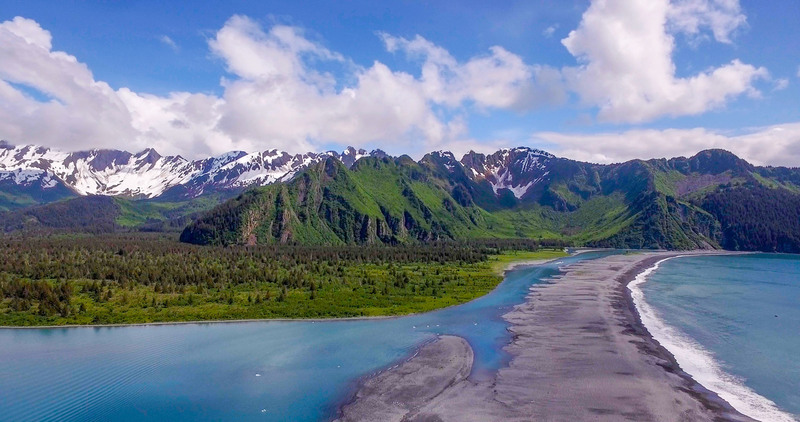 Our pilot Mike has flown these trips in Seward for many years. This is a fast and thrilling ride through the rugged landscape of Resurrection Bay. A maximum of 3 clients + 1 pilot are on the helicopter during a trip. For groups larger than 2, we can schedule multiple flights. The ride in the helicopter is roughly 15 minutes in each direction. The exact time is highly dependant on weather. Check out this short film we shot ourselves about our Bear Glacier trips. It should give you a good feel for what this trip is all about. 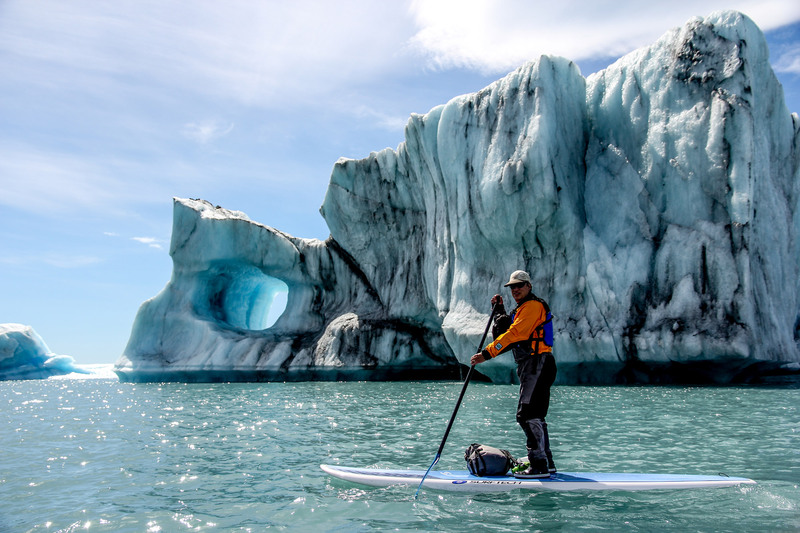 Lonely Planet writer Alexander Howard joined Liquid Adventures for a Bear Glacier Trip. Read it here.